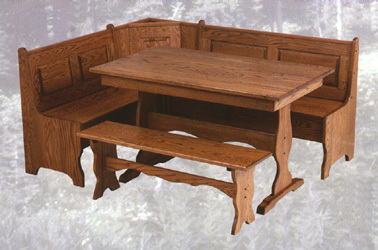 One of the most popular, if not the most popular item on our website has been our solid oak corner breakfast nook. Many customers have asked us if the Amish made it in any other styles besides just the single pedestal version, and we are pleased to offer you the latest addition to our corner nook line! Sturdily made by the Amish out of solid oak, and complete with storage in the benches just like our single pedestal model, this one features the trestle-style table configuration and slightly different dimensions than our original corner nook. Need a different size? Ask us! The Amish have been custom building these by request. Many customers have also purchased the corner nook with a couple of our Amish stools and specialty seating, or dining room chairs instead of the front bench.